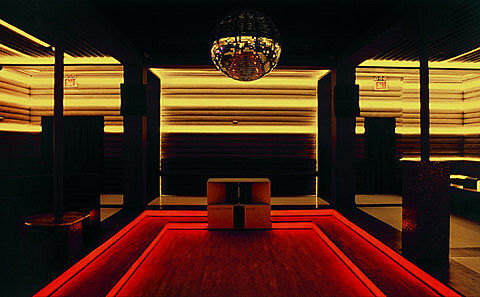 We were just talking about a new dance club that will be known for its soundsystem opening in Williamsburg (and the “new Brooklyn electronic underground“), but let’s take a second to acknowledge a NYC club with similar specs that has been going strong for a decade. 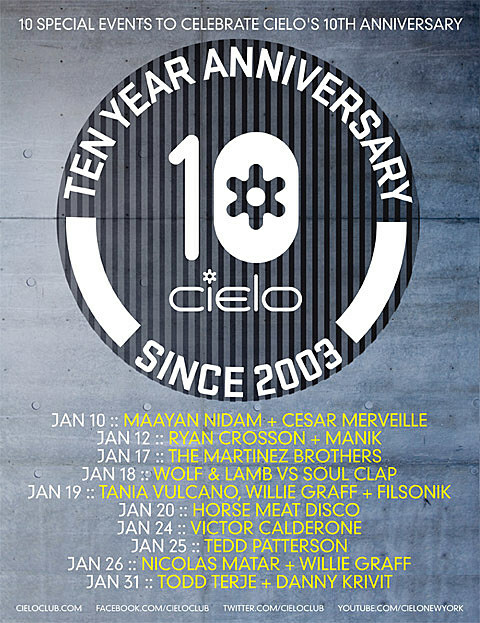 Cielo (18 Little West 12th Street) is celebrating its 10th anniversary in existence with events all month. They also were just named “Best Sound System in North America” by Beatport. With two down and eight celebratory nights still to go, the party continues tonight (1/18) with Wolf + Lamb vs Soul Clap which is sold out; and moves on to tomorrow (1/19) with Tania Vulcano, Willie Graff, and + Filsonik before finally polishing off the weekend with Horse Meat Disco on Sunday (1/20). Another weekend of events follows, leading up to the finale with Todd Terje & Danny Krivit on 1/31. Tickets to all those shows (apart from tonight’s) are still available. Congrats to Cielo! Full listing of 10th Anniversary events are below.